VICTORY UPDATE: May 28, 2016: Many thanks to those who helped Jungle Friends speak out AGAINST the Banana Derby last October! Because of your support, all Non-Human Primate Acts have been BANNED from the Alachua County Fair! This victory wouldn't have been possible if not for your support- thank you to everyone who contacted the County Commissioners and went to the County Fair to speak out against this cruelty! Please contact the Alachua County Commissioners and ask them to put policies in place preventing exotic animal shows at the county fair. Let's make sure Banana Derby stays out of our community. The fact that the “Banana Derby” monkeys have no teeth and are chained to dogs, is reason enough to stop this type of entertainment. They are in distress. Visit Banana Derby's website to see how they promote animal cruelty as "entertainment." Over the past week, Jungle Friends has been speaking out against two animal shows performing at the Alachua County Fair -- The Amazing Rainforest Experience and Banana Derby. 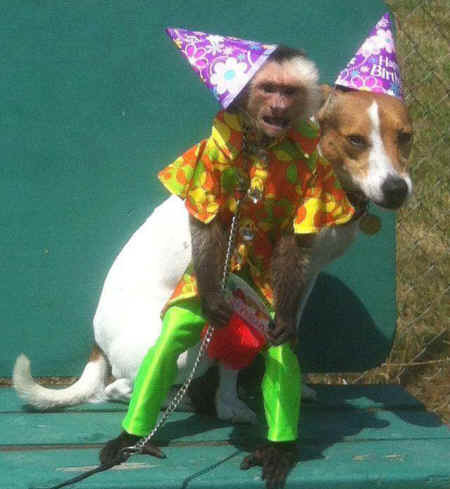 Both shows feature capuchin monkeys with Banana Derby displaying the most egregious activities. 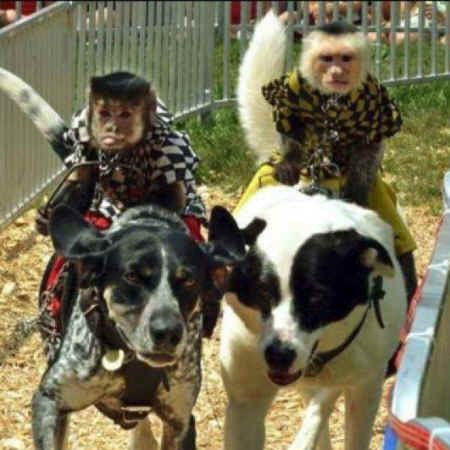 For those who are unfamiliar with Banana Derby, capuchin monkeys are dressed as jockeys, chained to dogs and forced to race in a sad mimic of horse racing. All of the monkeys have had their teeth removed, a cruel and inhumane practice that leaves them defenseless. Banana Derby has several videos on YouTube which clearly show frightened monkeys reaching for the railing in attempts to get off the dogs. Aside from the nightly performances in front of large screaming crowds, the monkeys and dogs are carted from town to town appearing at fairs and carnivals across the country. Gainesville Vegan ARA Network contacted Jungle Friends about the abusive circus act. The group also organized a public protest outside of the fair and Jungle Friends was happy to support them. When we were contacted by our local news station, TV20, Kari Bagnall provided them with her expert opinion on the matter in hopes of educating the public that these monkeys are suffering. Because we stood up for the monkeys, we are now the target of online bullying and harassment from the owner/operator of Banana Derby. What started off as salacious posts to our Facebook page and recruiting fellow animal exploiters to give us bad reviews; has turned into online smear campaigns and petitions positioning Jungle Friends as a "monkey prison" and our founder as a "monkey warden". What's even sadder, is the public has fallen for this man's con-artistry and are unknowingly supporting his lies. 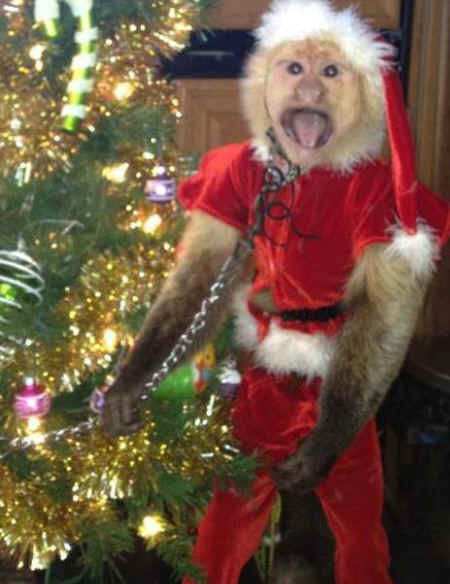 He has started two online petitions and a Facebook page against Jungle Friends. Many of our supporters have tried to expose his lies by revealing the truth through posts on his page but he is quick to delete them and then block the commenters. We find it extremely disheartening that a grown man would revert to such child-like behavior. It is more than obvious he is angry at Jungle Friends for speaking out and is retaliating in the only way he knows how--through harassment and bullying tactics. We know that the subject of "animal rights" can be touchy for some, but as with any great historical rights movement it is begun by a small group of like-minded individuals who want change. It is our mission and duty to not only save monkeys but to advocate for them. Please join us on our mission and be a voice for the monkeys!